One of my favorite things about spring and summer is all of the fresh ingredients available and that’s particularly true when making dessert. This Easy Homemade Blueberry Cobbler is a great way to enjoy the flavorful fresh berries all summer long and everyone LOVES this dessert. 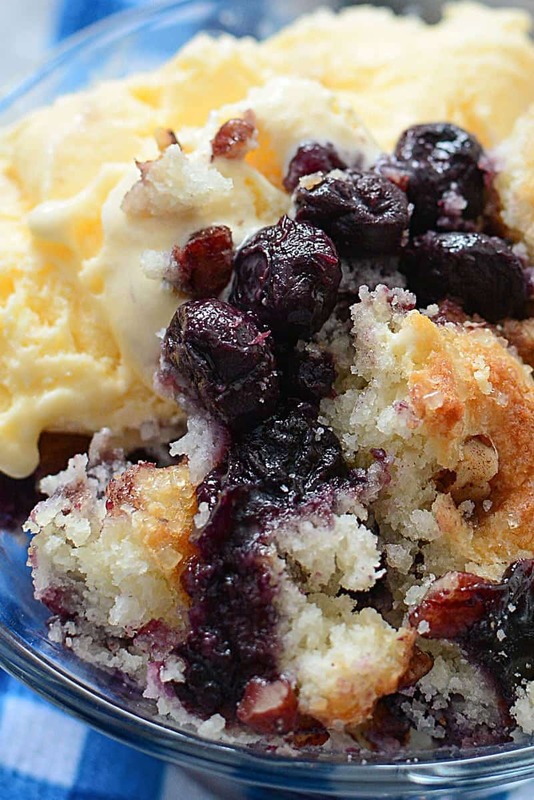 This blueberry cobbler gets made quite frequently at our house during the summer. She was pretty excited to help me make this Blueberry Cobbler, although she didn’t know we even had blueberries ’till I brought them in from our outside fridge. Since the dough is so easy to make, I let her help with that as well as placing the dough on the blueberry mix. Her favorite step was sprinkling the Turbinado sugar over the top. I love Turbinado sugar because it makes the final presentation look pretty but you can easily substitute brown sugar if you need to. What is the difference between a crisp, crumble and cobbler? 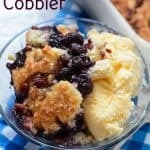 Cobblers, crisps, and crumbles are similar due to the fact they all have fruit fillings, but what makes them different is the makeup of the toppings. Cobblers are usually made with a sweet biscuit type dough, although short-cut recipes can be made with cake mixes (my favorite) or store bought biscuits tossed in sugar. Fruit Crisps, on the other hand, are usually topped with an oat/granola type topping that “crisp” up wonderfully when baked. 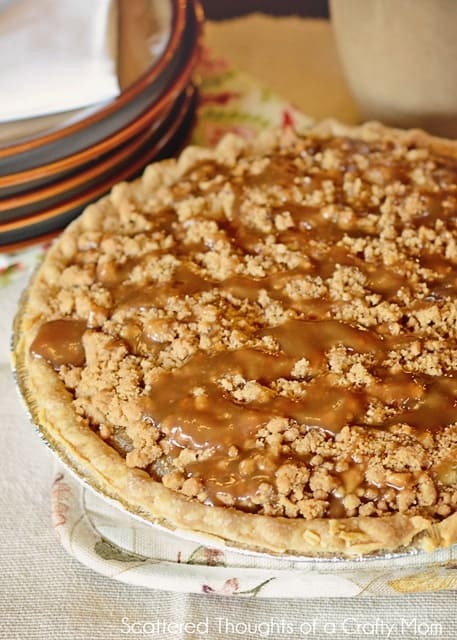 A Crumble is more of a flour/sugar mixture with butter cut in, like what you see on a coffee cake or this apple pie. 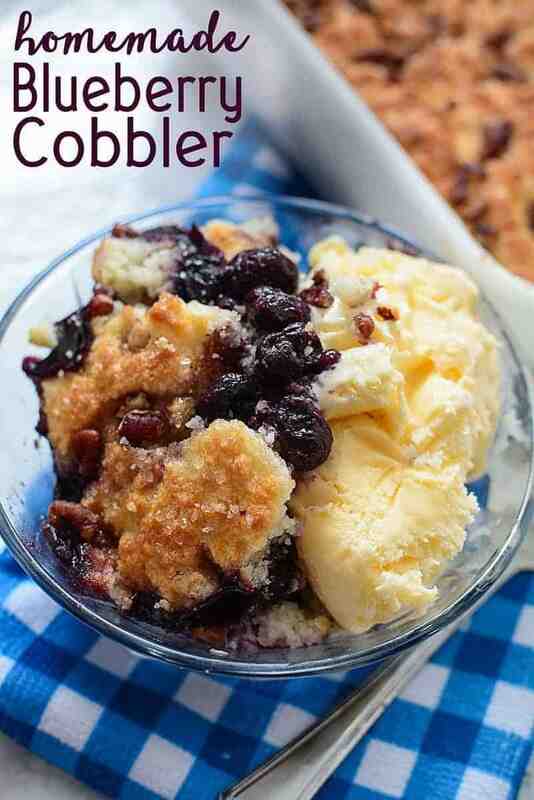 What fruit is best in a cobbler? Almost any fruit, fresh or frozen will work in a cobbler, (except maybe watermelon- could you imagine that?) If using frozen, your recipe will turn out best if you allow the frozen fruit to fully thaw and come to room temperature. In my opinion, though, seasonal fresh fruit is the best. There’s nothing more delicious (or easy) than tossing a few cups of fresh fruit with a bit of cornstarch and sugar for the base of your cobbler. You can even mix fruits your favorite fruits for more depth of flavor in your fruit cobbler. 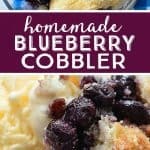 Is Blueberry Cobbler Served warm or cold? It’s good either way, but I prefer it served warm with vanilla ice cream. 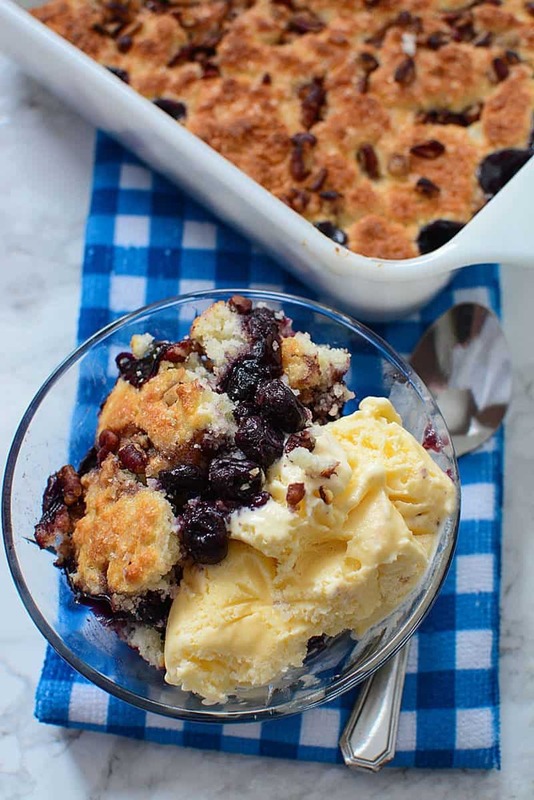 This Easy Homemade Blueberry Cobbler will impress family and guests alike….and quickly become your most-requested summer dessert recipe! 2. Spray a 13 by 9″ baking dish with nonstick cooking spray. 3. In a large bowl combine blueberries, 1/4 cup sugar, cornstarch 2 tablespoons water, lemon zest and juice. 4. Spoon Blueberry Mixture into prepared dish. 5. In a medium bowl whisk together flour, ¼ cup sugar, baking powder and salt. 6. 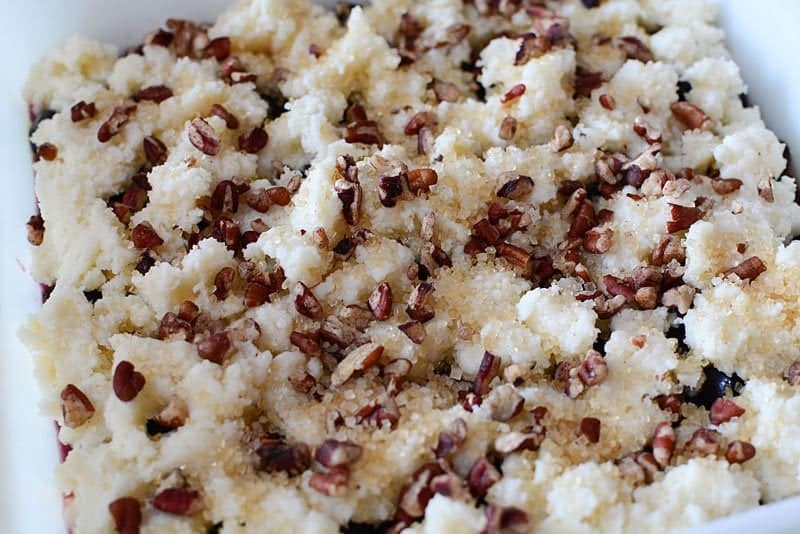 Using a fork or a pastry blender cut butter into flour until mixture resembles coarse crumbs. 7. Add cream, stirring gently just until a dough forms. 8. 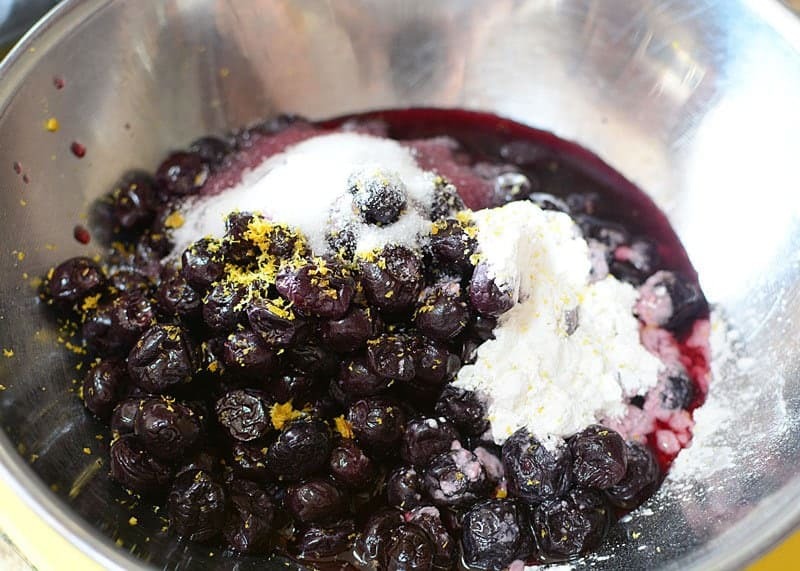 Tear dough into 3″ pieces and arrange over blueberry mixture. 9. Sprinkle dough with pecan pieces and Turbinado sugar. 11. Serve warm, with a scoop of vanilla ice cream. I love to keep Turbinado sugar on hand for baking as it makes the final presentation so pretty, but you can substitute brown sugar if needed. Fruit Juices will thicken as the cobbler cools. I recommend serving the cobbler warm with a scoop of vanilla ice cream, but it also makes a delicious breakfast the next morning, served cool with a dollop of whipped cream or thick vanilla greek yogurt! Nutrition calculated with 12 servings an no ice cream.